Pensacola - Object Head Neemo! May I ask where you found the head / how you searched? I seem to only be finding tiny re-ment pieces or large toddler fake pieces. of anything really, i'm searching different ideas & I can't seem to find the correct size . I got the orange at Hobby Lobby--I went looking for a properly-scaled SOMETHING for a head but wasn't sure what I'd go home with. I found the orange on a branch with a larger orange and decided it was perfect (orange is also my favorite color and flavor!). Penny's head is 3.5cm. 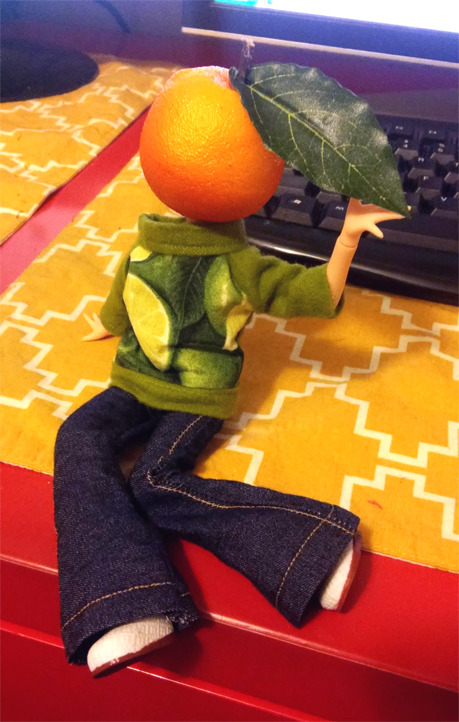 If you wanted a more Pullip-scale head you could use a normal faux orange. Foam fruits are gonna be easier to use than plastic ones (although the peach I'm buying is plastic I think, but needs must). You can search "mini artificial fruit" or "mini faux fruit" on Alie ress, eBay, the supplies part of Etsy, Hobby Lobby, etc. If you wanted something other than a fruit it might be easiest to just go shopping in person D: Hobby Lobby had a few birdcages and succulents that woulda made really cute heads too! The cutesy PN body is really working for her! 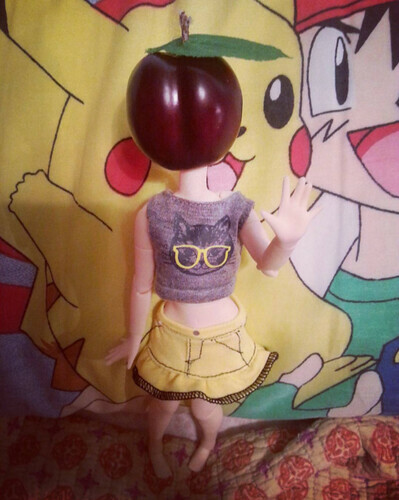 Oh my gosh, she's really adorable, especially on her new body! 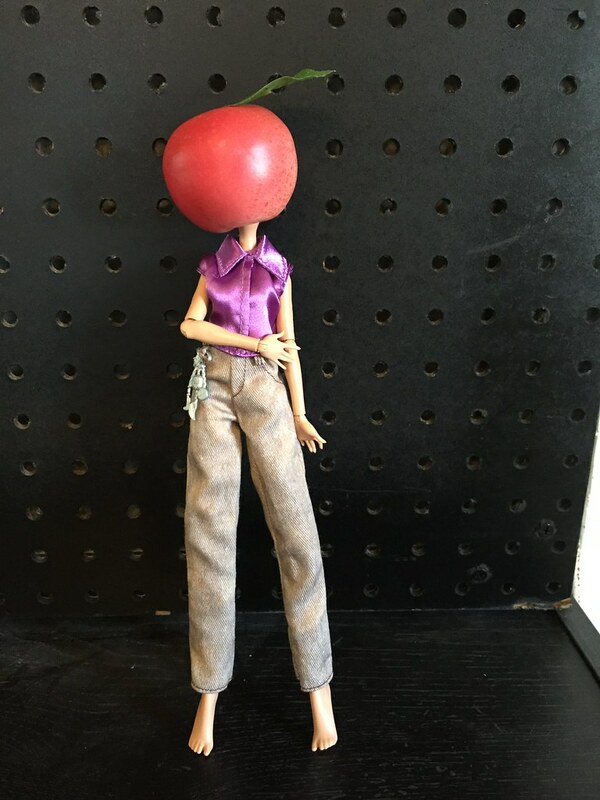 Well, color me a copycat- I now have an apple head girl. 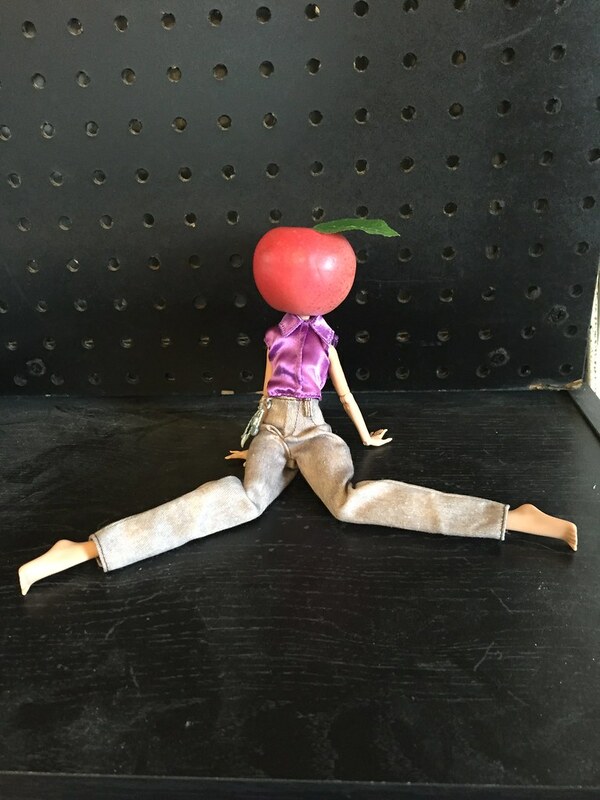 Mine is also the smaller fruit from one of the fruit branches at hobby lobby, but she's on an ever after high body since that's what I had laying around. I need to make her clothes that suit her better- I'm thinking she can have a kind of country girl vibe- and I haven't settled on a name yet, so suggestions are welcome, but I like her! This is the first time my roommate/best friend has looked at one of my dolls and said "I don't get the appeal," but honestly I'm kinda wanting to make more now too. I think a country girl vibe would be perf! Anyone for a banana head girl? Ahhhh she's so cute! Maybe Gala for a name? And I couldn't be more excited! 8D I went to Hobby Lobby this morning & picked out a handful of different fruits to try. Including a succulent to try eventually. My favorite ended up being the plum. Anyways, this is Glitch! She's a real nerdy, quiet girl, specializing in hacking. I'm actually super excited about her! Oh my, this is so adorable! (IMO Penny is lot cuter than the TV-heads.) It kinda makes me want to have one of my own - tough I could prolly not do without a face, so mine would probably have a face of some sort. Prolly just black lines smiley-face or something. Please post more pictures, I find them really cute. Oh noes, just realised... I have 2 soft (stuffed?) tomatoes that could be really close to right side... I thought to make them into somekind of headdress, but never did... Maybe I should go check if I could make it into fruit head!